As a bicycle accident attorney in Illinois I have handled cases throughout the state of Illinois. Due to the concentration of people in Chicagoland however, most bike accidents happen where the most people live and work. A large number of people in an area is called "density" by sociologists. It has been my experience that more than just density plays a role in collisions. Other factors are the layout of the area, traffic patterns, and traffic control devices like stop lights. The Chicago Sun-Times published an article listing the twenty most dangerous intersections in the Greater Chicago Area. The ranking was based on the total number of crashes in 2010. Note that these statistics mainly reflect accidents involving only motor vehicles. You'll also note that most of these are in the suburbs as opposed to the City of Chicago proper. Only 4 of the 20 (20%) most dangerous intersections are located in Chicago itself. I think this reflects my theory that more than density plays a role in collisions. This is why I am such an advocate for bike lanes, protected bike lanes, and signage. These "traffic control devices" are often little more than paint on the ground or a metal sign, but the impact in reminding motorists to watch for bicyclists is extremely beneficial. As a Chicago, Illinois bike attorney, I shudder to think of Halsted Street or Roosevelt Road without the painted bike lanes. Even with the bike lanes there are lots of bike accidents on those streets, without the bike lanes I think it could border on mayhem. 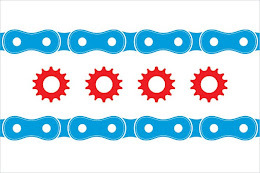 If you have any questions regarding this post or an issue involving Illinois personal injury law, please contact Chicago, Illinois Bicycle Attorney Mike Keating at 312-208-7702 or MKeating@KeatingLegal.com 24 hours a day, 7 days a week. All e-mails and phone calls are returned promptly. All initial consultations are always confidential and free.